In environments with high volatility, uncertainty, complexity and ambiguity, today known as the VUCA World, changes in the design of offices are increasingly necessary and crucial. This way work spaces incorporate innovation as an ally boosting common areas and reducing workstations assigned to specific employees, to name just a few examples. This idea gains much more sense when it is expected that in 2025 approximately 50% of Spanish workforce will be formed by millennials who want to be valued, independent and belong to teams; a place for collaboration where teams work together to solve problems and design strategies is a clear example. The physical expression of it is seen in the design of open-plan offices where employees can easily interact. The growth of an increasingly younger and empowered workforce is fostering common spaces also known as co-works. Such spaces defying traditional environments with independent cubicles separated between them, offer professionals a series of competitive advantages: they boost collaboration, creativity, exchange of ideas, creation of networks and socialization. According to the study “More the One” by Ofita, people spend 60% of their work hours in meetings or collaborating with others; and 40% of operative workstations are empty at any time of the day due to remote work, labour flexibility and the boom of collaborative work. This means that companies waste up to 40% in furniture costs they do not need while meeting and collaboration areas are swamped. For the next few years we expect that most collaborators will be either independent or freelancers. This means that as a consequence the demand of common areas will further increase. Those for team work have to be flexible and adaptable so that they vary depending on the needs of the moment. For example, when meetings are short and sporadic with many people and are combined with longer work hours in small groups during the most intense stages of certain projects. Those for informal communication meanwhile, have to promote interaction, informal exchange of knowledge, fun and blurred lines between personal and professional life. These have undergone a greater growth within the office these last years. Today it is possible to see club areas, cafes, cyber cafes and leisure areas with pools, ping pong tables, gyms with saunas, massage areas and relaxing areas, to mention some examples. According to Camilo Agromayor, Director General of Ofita, “You spend half of your time in the office and you need people to feel comfortable and wanting to stay”. Companies are reducing workstations assigned to individuals. 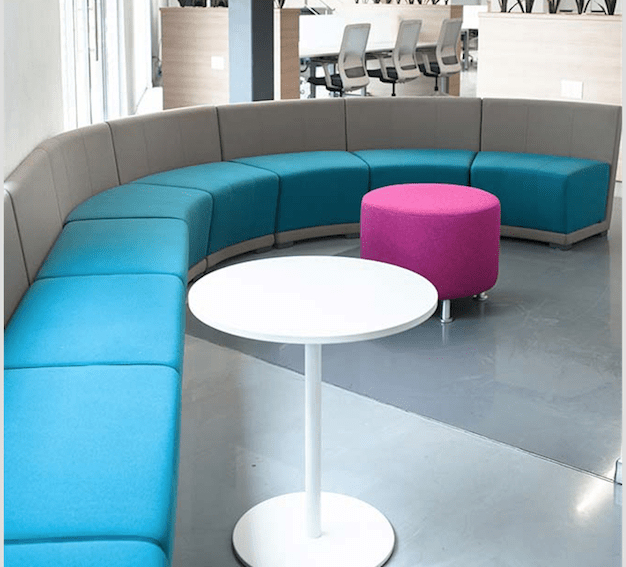 These new solutions allow a more rational use of the space which is designed and distributed depending on the real presence of employees instead of on their absolute number. It is a non-territorial system where areas are designed according to employees’ needs instead of their status. This system in which everything belongs to everyone provides considerable space savings, greater flexibility for the organization and helps quick adaptation and growth (breathing organisation) supporting employees’ mobility and their working methods. Nevertheless they all need to use personal and exclusive objects: documents, agendas or pens that have to be kept in a private space. To cover this need, each employee has a locker or a personal cabinet with wheels for example. “Plug and Work”, small workstations distributed through different areas of the office and appropriate for the rapid development of work not requiring a high level concentration. “Silent Room”, small enclosed offices designed for individual work requiring concentration or to make confidential calls without the normal nuisances of open spaces. Although telework or working from home is being encouraged in the last few years in several companies, especially corporations, it is still viewed with suspicion by some employees who do not trust completely this method. Nevertheless, it is expected that this reality will change and the reason has to do with two elements: productivity and once more, millennials.